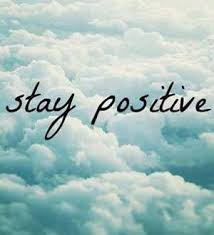 Chynna Laird's Lily Wolf Words: Writing Prompt Saturday ~ What Do You Do To Stay Positive? Writing Prompt Saturday ~ What Do You Do To Stay Positive? I was feeling cranky when I woke up this morning, not that I'm the best example for a 'morning person'. First, I got zero sleep because my youngest daughter came into my room in the middle of the night. This isn't an unusual occurrence. Usually, she flops down and sleeps on the floor until I notice her there, then I unsuccessfully try escorting her back upstairs to her own bed. She'll stand there staring at me vacantly, since she's still sleeping, so I end up guiding her into bed with me. Sleeping between a window-rattling snorer and a bed hog does not amount to a restful sleep. Then I came upstairs to have the one tiny cup of coffee I'm allowed to enjoy for the day. As I passed by the basement door, I glanced out the window to see the blustery, gray, icy day waiting for me, with snow on the ground to boot (thanks again, Mother Nature). Mumbling to myself, I planted down in front of my computer, grateful to have a job I can do wearing pajamas and sporting an out of control Einstein hair-do (my version of 'bed head'), to start my writing work day with emails. That's when my day started to brighten a bit. I got a message from a woman responding to an article I'd written on tips for families raising children who have Sensory Processing Disorder (SPD). As I always remind folks, I am no expert by any means of the stretch on any subject I write about. All I can do is share my own experiences and personal insight with the hope I can reach someone else out there struggling with the same issues. She seemed rather distressed in trying to find help for her niece. As I read through her message, I nodded with understanding because I'd been there, and still am to a certain degree. I shared a few personal snippets, then gave her links to the best places to get the ball rolling. As I hit 'send', I realized that as grouchy as I'd been earlier, that one person gave me the positive spark I needed to continue on with my day with a much more positive perspective. You see, it's okay to be grouchy, bitchy and fed up once in awhile. Vent about it, then let it all go. I find that turning to that one positive thing that always brings me back down, that one thing that makes me feel good about me and what I do, makes a huge difference in how I get on in the world. I remember that every tiny bit of good I put into the world, comes back in some way. How wonderful is that? My 'thing' is writing. I write when I'm angry, happy, excited, passionate or want to advocate for those who need an extra voice the most. I don't have to make everything I write public. I keep a few things just for me to remind me of what I'm doing and why, and helps steer me steady on the road of positiveness. So, there's your writing prompt for today. When you start the day off grouchy, when things seem to be going wrong no matter what you're trying to accomplish, when those stupid little surprise blips interrupt your routine, what do you do to stay positive? What brings you back to that place of calm? I wish you all a happy day and please think of me down here wearing three layers of clothes inside as my rebellion to an early winter.